Monday dawned clear and sunny. It came early for some and later for others but all managed to make it to breakfast, ready for a full day. The younger Scouts headed to the Eagle Bound program to begin their Scout skills training, while the older hands spread out through the camp to various merit badge classes. The adult leaders quietly pointed the way to the various locations for the Scouts, then repaired back to the campsite for some quiet reflection. At one point, a hammock even made an appearance and the Scoutmaster engaged in some meditative relaxation. There was a brief stirring as the commissioners came through to inspect the campsite but they satisfied themselves that all was well and posted a perfect 100 as our inspection score for the day. spend at the trading post. After lunch there was a brief pause while the camp staff conducted an emergency drill. This drill requires all campers to return to their campsites in order of account for everyone. It is part of the overall package of emergency procedures developed by the camp staff to cover numerous potential emergencies. 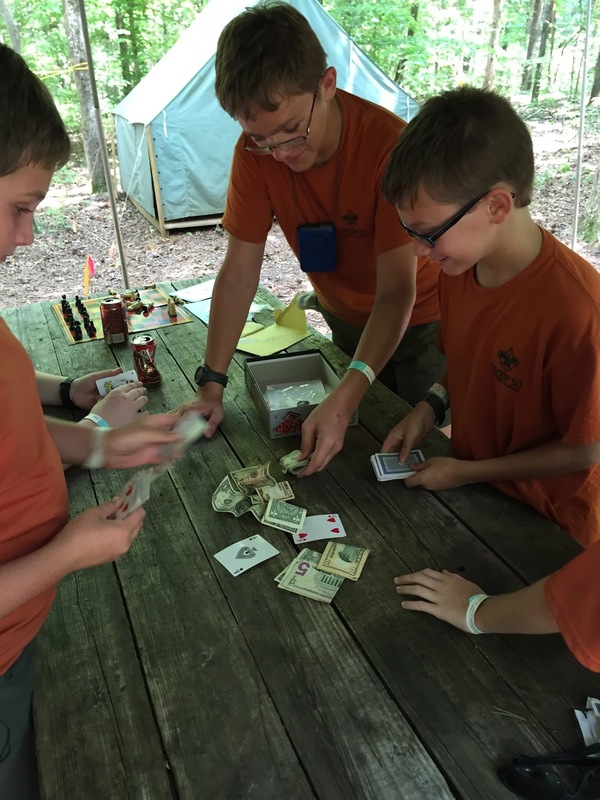 During the break, many of the Scouts broke out cards and games to pass the time. They also delved into the coolers and snack boxes, despite having just finished lunch. It seems they were fortifying themselves for the afternoon to come. At 2:00 we headed to the waterfront for some fun in the sun. Some of the boys headed for the waterslide (aka the Sequoyah Sidewinder) for a refreshing ride. The rest of the troop took to the water in kayaks or on paddle boards. Many of the Scouts took to it like the proverbial ducks to water and ranged far into the lake. At one point, several Scouts ganged up and attempted to corner the Scoutmaster with the malicious attempt to get his hair wet. Although there was some success on that front, the end result saw many Scouts soaked as well. Nicky approaches with a nefarious gleam in his eye. Miles demonstrates his prowess on a paddle board. Following our boating adventure, everyone moved over to the swimming area for a refreshing swim and the chance at the diving board. The result was a mixture of diving, cannonballs, belly flops and some entries into the water that defy the ability to describe them. By the time we finished, everyone was ready for a good dinner and (hopefully) a good night's sleep. The other event of the evening was the trip out to Adventure Valley. As this post is being written, the boys are just returning, covered in mud. The tale of their experience is a story for the morn. More photos are available on the online photo gallery. Also, before I start to get calls and emails from concerned parents, the photo of the card game was staged. Just an example of how Scouts can react when a camera is pointed in their direction.